UST BECAUSE you shouldn’t be indiscriminate about which arguments you are willing to go to the wall for doesn’t mean that you should never take a stand for principle. I had a conversation with several music directors yesterday about funeral preparation, and the conversation naturally had a sidebar about funerals, weddings, and how to turn down a request from a family. 1. Be clear that you’re saying no. Here’s a trap I’ve fallen into before. I try to let a bride down gently regarding her choice for a particular piece of music, but what she really hears is, “It isn’t the best choice, but I’ll do it anyway.” When you say No, make sure that it is understood that you really aren’t going to do it. 2. Offer an alternative. It stinks to be in the position of Gatekeeper of the Liturgy, and it also stinks to be on the receiving end, where a bride or family has suggestions that have genuine connections for them, but they feel like they are just trying to get past the censors. Every time you say no, counter with a suggestion and, most importantly, explain why your suggestion fits better without attacking theirs. 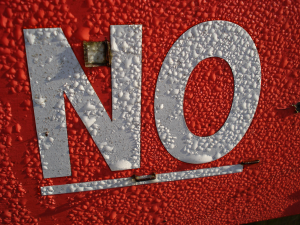 If you say No, but provide a way out, it’s often all that is needed to diffuse the situation. 3. Take the opportunity to teach. Often, the people with whom we are discussing such matters are people who have not been to Mass in a long time; sometimes they aren’t Catholic at all. Even if they are, usually all they know about liturgical music is that they like That Song and really want it at “their liturgy.” This can be a great opportunity to teach a bit about liturgy, solemnity, and the dignity of our worship. Sometimes they won’t listen, and sometimes (like in the case of a funeral) you have to use your best judgment to determine what will sink in at this particular moment. Once again, many of these problems arise because they just don’t know. I am currently trying to absorb as much as I can about this skill. Our archdiocesan Director of Worship is the master here. He can not only steer people away from bad choices, but can make them feel like a million dollars while following his guidelines. The trick is to avoid making them feel silly while gently guiding them in the right direction. And don’t even meet with the mothers.